The IndyCar field surprised Robert Wickens with an early 30th birthday celebration before Sunday's race at St. Petersburg. The Canadian is at a track for the first time since he suffered a spinal cord injury in an August race. He turns 30 on Wednesday. The IndyCar field surprised Robert Wickens with an early 30th birthday celebration before Sunday's race at St. Petersburg, Fla. The Canadian is at a track for the first time since he suffered a spinal cord injury in an August race. He turns 30 on Wednesday. Wickens, from Guelph, Ont., was surprised before the morning warmup when all 24 drivers in Sunday's race greeted him in the paddock and sang "Happy Birthday to You" as he was surrounded by gold balloons. Wickens made his IndyCar debut in last year's race at St. Pete, won the pole and led all but the final two laps. He was spun before the finish and denied the victory. He missed the final three races of the season after his accident at Pocono but still won rookie of the year honours. Wickens has insisted he will walk and race cars again, and his immediate goal is dancing at his September wedding. 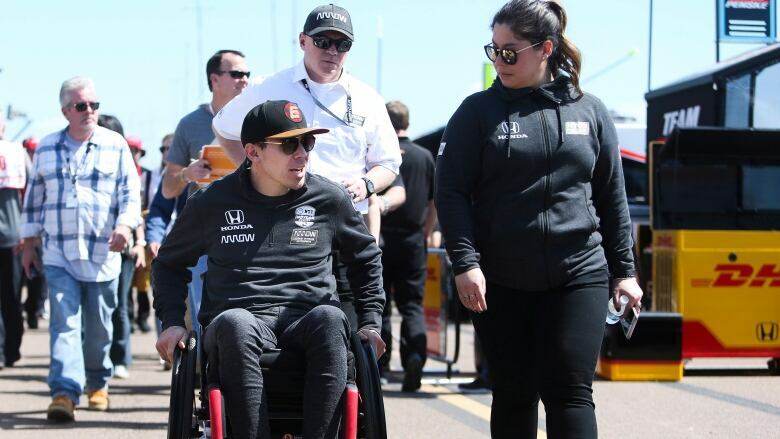 He participated at St. Pete in the driver autograph session and had an appearance at a fan event, but he used social media to ask well-wishers to stop patting him on the back because of nerve sensitivity. "The support from the fans and the IndyCar community is incredible, however I would like to take the time to just mention that I still have nerve pain from the incisions, and would really appreciate it if people could stop patting me on the back and just simply wave hello!" he wrote. "I love chatting and meeting you all, but my back is very tender. A wave is much appreciated."